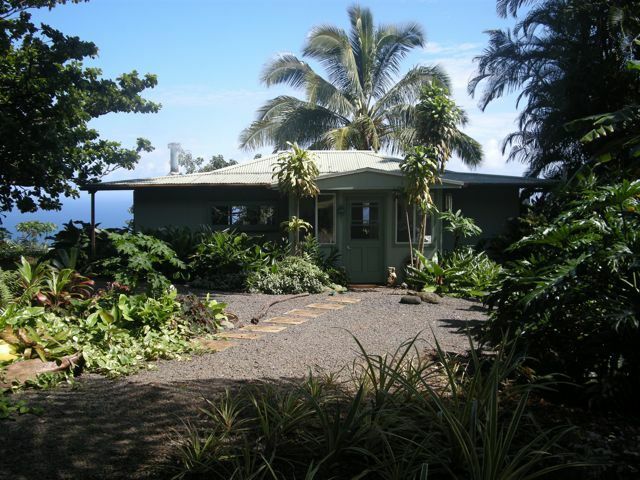 Entabeni Cottage, sits above the Road to Hana overlooking the Pacific Ocean on the north shore of Maui, Hawaii. Entabeni Cottage is a fully-equipped, 830 square foot home, powered by the sun and beautifully situated on a gorgeous 6.25 acre tropical flower farm. Enjoy ocean views from your bed, kitchen, lanai (covered deck), & private yard. The Kristiansen Family offers guests fresh eggs and vegetables from the garden when ready for harvest. • Michael Kristiansen, born in South Africa, has a degree in Landscape Architecture, Park Administration, Ornamental Horticulture, and is a Certified Arborist. Michael is a consultant in landscape management and horticulture, runs workshops in tropical horticulture, pruning, mulching, composting, docent training, and staff training. He is the past Director of the Honolulu Botanical Gardens and a long-time teacher at UCLA Extension in Landscape Architecture and Gardening and Horticulture. • Terry Kristiansen, manager of Entabeni Cottage, has worked with Michael for the past 46 years of their marriage and shares his love of nature, the tropics, and their 6.25 acre flower farm on Maui. We share our lives with our two sons and their families, plus three dogs, four cats, and a flock of chickens and free range guinea fowl. We grow flowers, fruit and vegetables. We offer fresh eggs and vegetables to our guests. If you are interested in tropical plants in a peaceful environment and enjoy the sounds of birds, Entabeni is the place for you. We are connected to nature and all that nature has to offer. Delicious eggs, organic vegetables, spectacular views, tropic fruits when available, and an opportunity to commune with nature at your doorstep. Our cottage has a walk-in closet. We loved this cottage! Terry was very accommodating but also gave us our privacy after introducing us to the property. We spent extra time exploring the Hana area and both slept like babies with the island breeze at night. The view is spectacular. I woke up early to enjoy coffee on the lanai overlooking the ocean. The cottage had everything we needed and then some. We are getting married tomorrow in Wailea and the cottage was a perfect way to start our trip. We will definitely stay here again if we make it back to Maui. Thanks so much for everything! The setting is spectacular, the accommodations very comfortable, and our hosts were charming. Be sure to tour the grounds with Michael! We had high hopes, which were exceeded during our visit. The owner of this property is a professional landscape architect, who has spent years developing this horticultural paradise near Hana. It is with the precision of a scientist and the imagination of an artist that he has enhanced this bit of Maui into such a beautiful site. His expertise is apparent in every nook and cranny. I cannot recommend this property enough! Rather than listen to me talk about it, book this property yourself. You will not be disappointed! Really enjoyed our time at the cottage and liked the "country" feel it had and the surrounding landscaping. View was great and we were able to see some whales from the back porch one morning. We did encounter multiple instances where we lost power for periods of time without much of a power draw taking place from our cottage which caused some frustrations but overall the experience was good and we would stay here again! Our stay at the Entabeni was just that, a little slice of heaven. Terry and Michael were very welcoming and most gracious hosts. From the fresh eggs for the morning breakfast ala Terry, to views of the ocean with morning coffee on the lani, to a comprehensive tour of the farm by Michael, our stay couldn't have been more relaxing and at the same time invigorating. Our return can't be soon enough. Thank you! Thank you! THANK YOU!!! Our last stop in Mauii and it was the best!! !